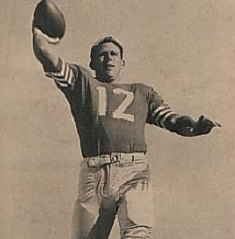 A consensus first-team All-American who led the nation in passing and total offense in 1956, Brodie was chosen by the 49ers in the first round of the 1957 NFL draft (third overall). He saw little action as a rookie backup to well-established QB Y.A. Tittle, but following a strong preseason in ‘58, Brodie was handed the starting job by Head Coach Frankie Albert. 49ers went 6-6 to finish fourth in the NFL Western Conference. Brodie relinquished the starting quarterback job back to Y.A. Tittle during the second half of the 1958 season, and remained primarily a backup for the next two years until inheriting the full-time starting job in 1961 (playing out of Head Coach Red Hickey’s shotgun offense for several weeks). With all of the necessary tools but plagued by inconsistency, he was selected for the Pro Bowl in 1965 after leading the NFL in pass attempts (391), completions (242), completion percentage (61.9), yards (3112), and TD passes (30). Brodie also led the league in pass attempts (404), completions (234), completion percentage (57.9), and yards (3020) in ’68, but in between were years of mediocrity, both for him and the team. His finest season came in 1970 when he led the NFL in completions (223), yards (2941), TD passes (24), and overall passing (93.8 rating) and received MVP as well as consensus first-team All-league honors as the 49ers advanced to the NFC Championship game. Brodie had a lesser year in 1971, throwing more interceptions (24) than TD passes (18), but the 49ers again won the NFC West with a 9-5 record and advanced to the NFC title game, losing for a second time to Dallas. Brodie went down with a severely sprained ankle in ‘72 and gave way to Steve Spurrier, but rallied the team into the playoffs for the third straight year, although the 49ers once again fell to the Cowboys (this time in the Divisional round). He retired after the 1973 season, ranking third lifetime in the NFL in both pass attempts (4491) and completions (2469) while having thrown for 31,548 yards with 214 TDs and 224 interceptions. Brodie’s #12 was retired by the 49ers. He went on to participate for almost 15 years in the Senior PGA Golf Tour.